Hotlinking is linking directly to an object such as an image from one site into a webpage of a different site. Hotlinking is no good because it steals the bandwidth of your server. Hotlinking is an intellectual property theft because using an image or multimedia file without the permission of the website owner. Instead of saving the image to their desktop and upload to their own server, they link to the picture directly. Each time the webpage with the hotlink image load, it will use up you bandwidth. If there are many people that access the webpage, it will eventually use up a lot of your bandwidth. One of the most common examples of hotlinking is linking directly to an image in a forum post. Many people also hotlink their forum signature images directly. Hotlinking will cause the owner of the website to lost bandwidth. Consequently, the website will load the pages slower. With Cpanel, you can prevent other users from hotlinking the images on your website to stop them from consuming the bandwidth of your server and prevent intellectual property thief. Website owners can redirect the user to another webpage with your warnings when they access the URL of the image. Website owners can also replace the hot linked images with an warning image to stop the person from hot linking again. Hotlinking is thieving even though it is a free clipart offered by a website. Unless you the website owner states that you can directly link the clipart, hotlinking is stealing. Each time the file is load, it will called from the server of the website owner and use up some bandwidth. Bandwidth is not free. Most hosting providers limit the amount of bandwidth transfer a website can have. If too many bandwidths are used, the website owner will need to pay more money. 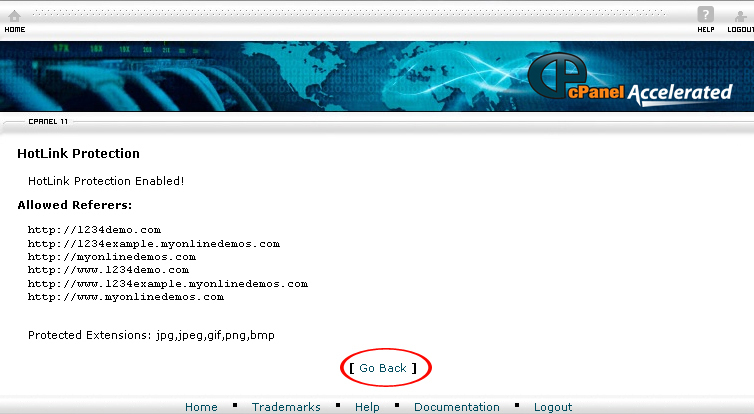 On the homepage of your cPanel, click the HotLink Protection icon. Click the Enable button in order to enable HotLink protection. Enter the URL of any domain that you wish to allow hotlinking. By default, it will block access for these extensions including jpg, jpeg, gif, png, bmp. If you want to add other extension that is not in the text box. Enter it in the Block direct access for these extensions (separate by commas) text box and separated each extension with comma. In the URL to Redirect to text box, enter the redirects URL in order that anyone who tries to hotlinking will be redirected to a different page and read your warning message. If you follow the guidelines stated above, you can easily disabled hotlinking on your website.